The Four Seasons Palm Beach Resort is jaw droppingly awesome. It’s one of my very favorite hotels. One reason is that it is visually stunning and the design elements are fabulous. The other reason is that the staff here is one of the most friendly and welcoming I’ve ever experienced. Every single person I encountered at this hotel was crazy nice and made me feel so comfortable and happy to be there. 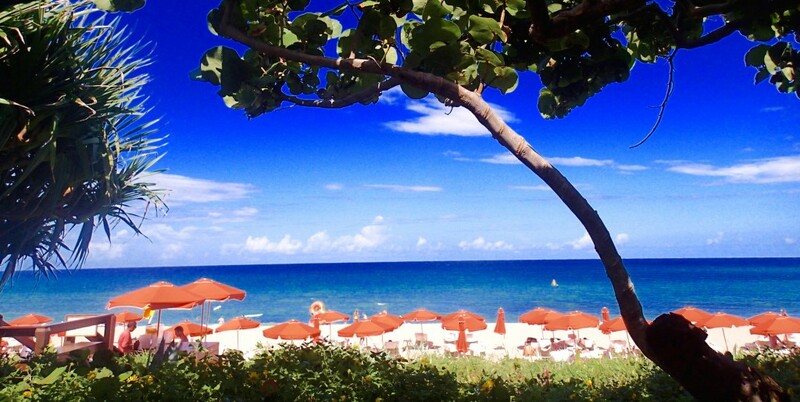 If you ever need a strong dose of positive energy, go to the Four Seasons Palm Beach and bask away. This place is spectacular and I totally fell in love with it. 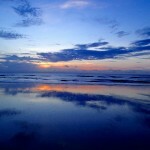 Immediately upon arrival, worries fall away and everything just works, you can start enjoying your time right away. The staff anticipates your needs before you even think of them and the whole experience just flows, they make you feel completely at ease. 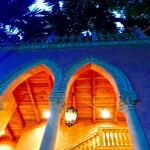 The magic of this hotel is that it manages to be ultra luxurious but at the same time, very easy going and relaxed. Despite the palatial surroundings, there is not a shred of stuffiness. The breezy vibe extends to guests as well. I noticed the people around me we extra friendly and joyful. The room decor is perfection. It’s elegant and comfortable with impeccable design. Blues, white and silver are soothing to the eye and reminded me of sea glass. 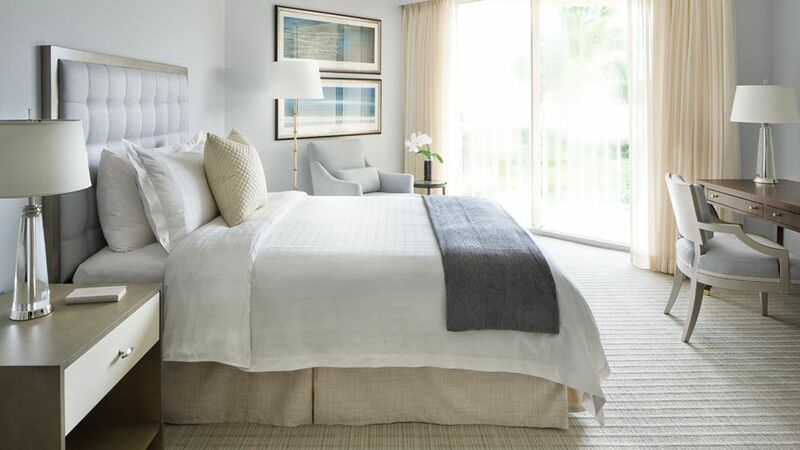 As always at the Four Seasons, the bed is a cloud of restful heaven. The look is beachy-luxe. 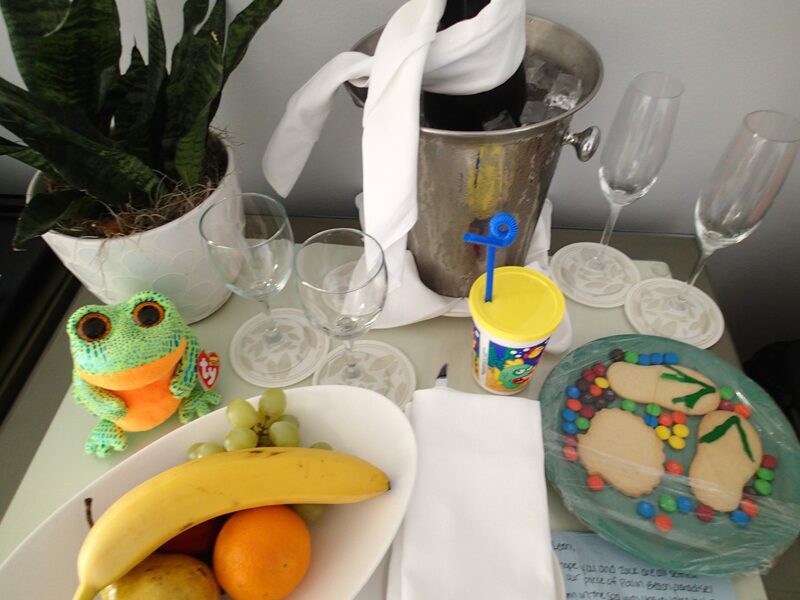 One thing I love about Four Seasons Resorts is their complimentary Kid’s Clubs. Like other FS Kid’s Clubs, you can drop your children off and pick them up when it’s convenient for you. 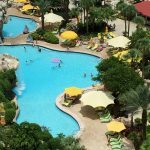 There are no set times (apart from open-closed) like other hotels have and this is an important point which adds to the relaxing nature of the resort. You are on your own schedule. 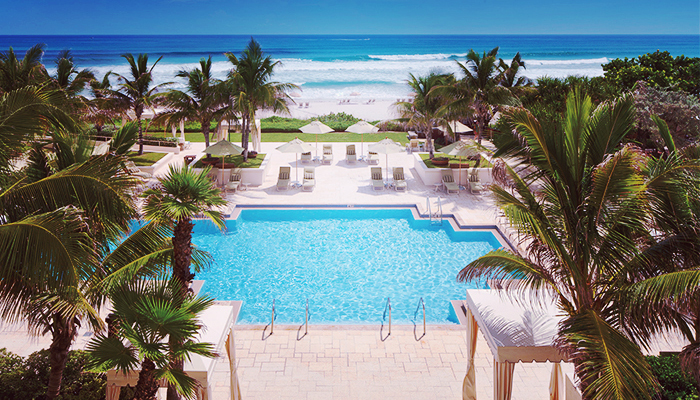 You can relax by the pool, enjoy some water sports, or go the the spa for a signature Ocean Bliss massage. One of my favorite things about this hotel is all the activities readily available. 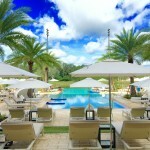 The Four Seasons Palm Beach Resort is great for active people. 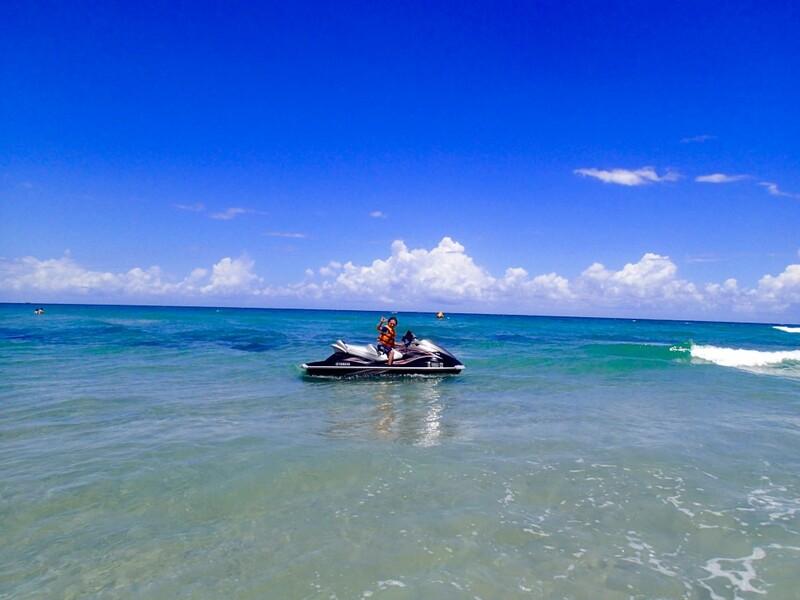 You can hop on a Wave Runner, take surfing lessons, paddle board, or chill out on a float with rentals at the stand on the beach. The guys running the stand were helpful and seemed to know what they were doing, I felt like we were in good hands. We’d never been on a wave runner before and it was so fun! My son also learned to surf here. 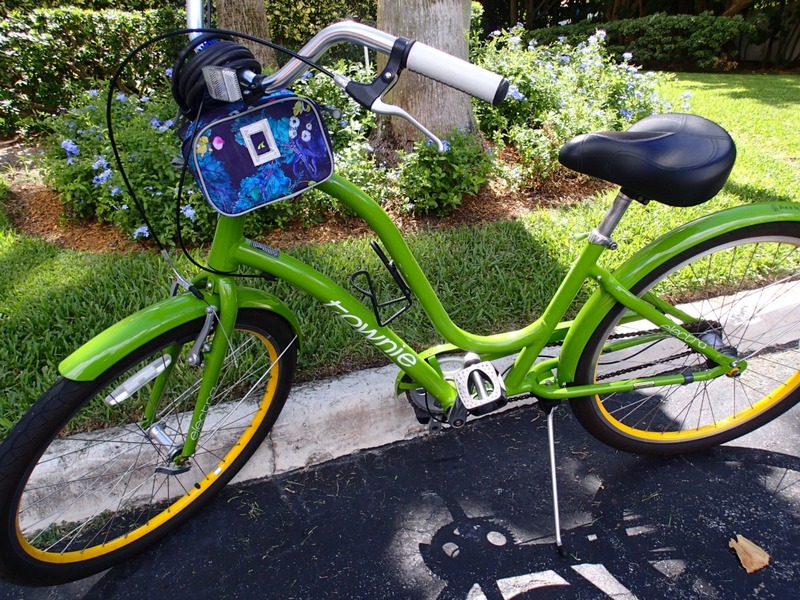 Complimentary beach bikes are available—and not just any beach bikes, but my favorite brand, Electra Townie cruisers you can ride around town. Right outside the hotel, there is a long flat strip for easy biking with some nice views. I love to swim laps, and the pool is set up for this until 9 am. After that it becomes a family friendly spot with people splashing in the water and hanging out poolside. Views from the pool are of palm trees and the beautiful Atlantic ocean which is fairly clear here. It’s so blue and clear it feels a little like Mexico. 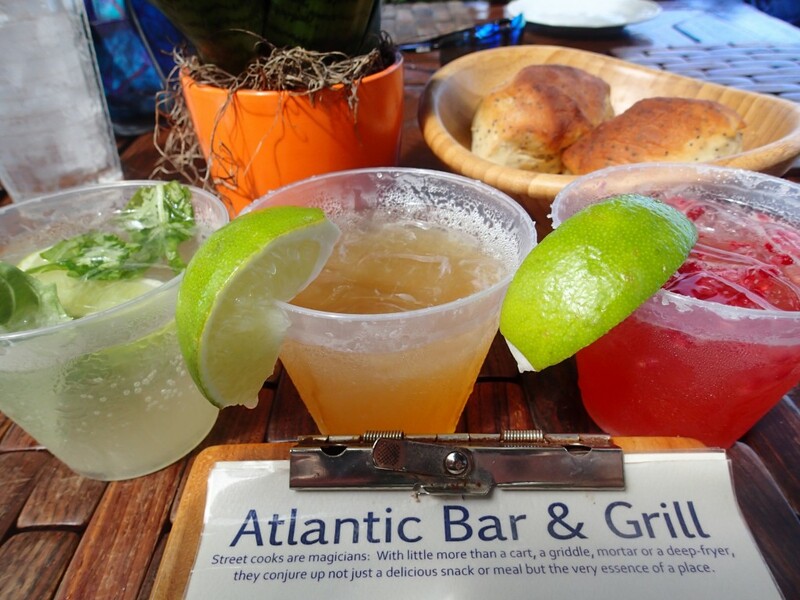 Speaking of amazing views, you have to eat at the Atlantic Bar & Grill. You’ve never tasted a fish sandwich until you’ve had the Talapia Plantain Fish Sandwiches here. 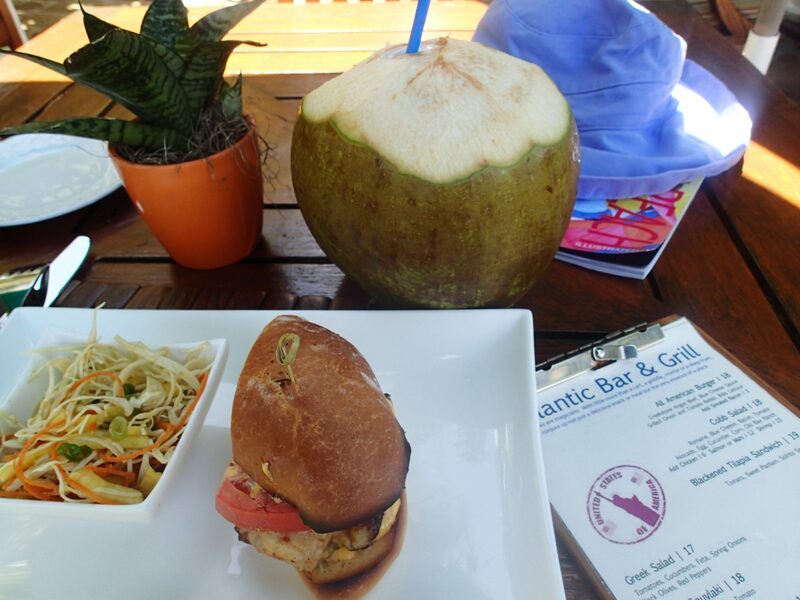 Set outside amidst mangrove trees, bright orange umbrellas and salty sea air, the Atlantic Bar & Grill is casual and relaxed–the kind of place you could enjoy wearing your bathing suit cover up. 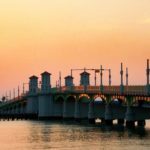 The food is fantastic and it’s right on the beach with views of bright orange beach umbrellas set against a backdrop of turquoise and cobalt seawater. This unassuming al fresco restaurant is super casual–you could go in the middle of playing on the beach wearing your coverup. AB&G is a place to just kick back and watch people surfing and playing on the beach. The ocean breeze is refreshing and the atmosphere is perfection. It’s the kind of place you crave months after visiting. Not just the food, but the ambiance and positive energy from the people around you. 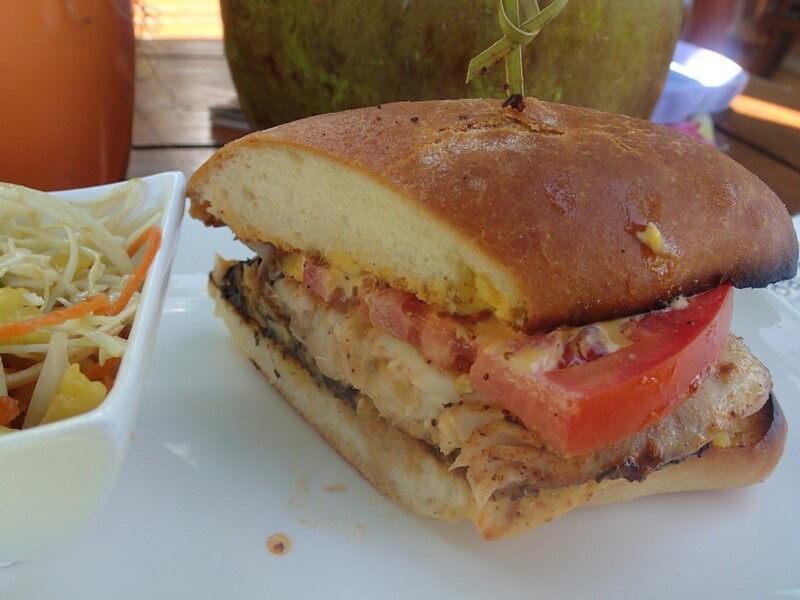 The Blackened Tilapia Sandwich with local plantains was probably the best fish sandwich I’ve ever had. I’m not even a fish person, I rarely eat it. 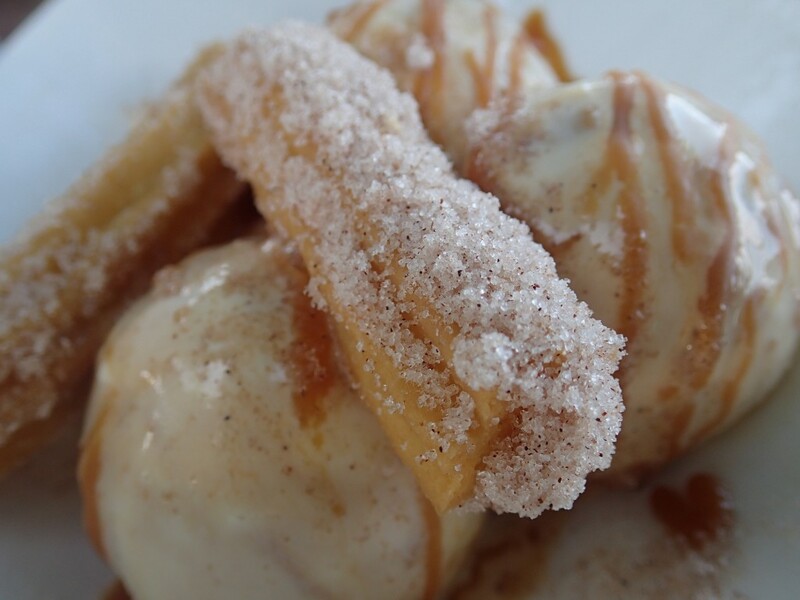 But I would eat it a whole lot more if it always tasted like this. They have terrific cocktails. I tasted the Mojito, Margarita, and Strawberry Margarita and couldn’t decide which I liked best. The most exciting drink they have is coconut water straight out of a fresh coconut. This is my favorite beverage and tastes like heaven sipped slowly right from the fruit. 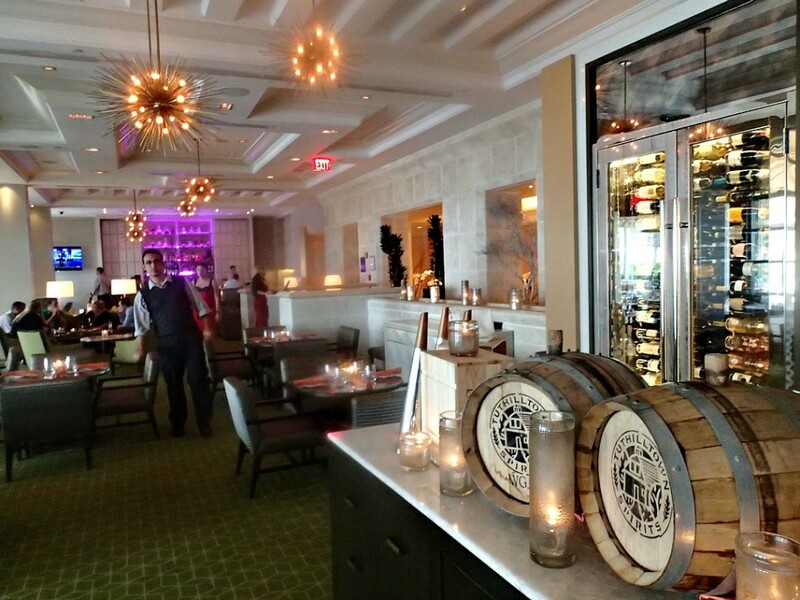 Jove is the upscale dining option with its fun metallic atmosphere with sputnik lights and Italian themed menu. We had pizza, salad, and cannoli, all made from scratch. I enjoyed Atlantic Bar & Grill more because it’s so beachy and Floridian, but it’s nice to have quality indoor options. This resort is vegetarian and pescatarian friendly and has fresh pressed green juice in the morning. 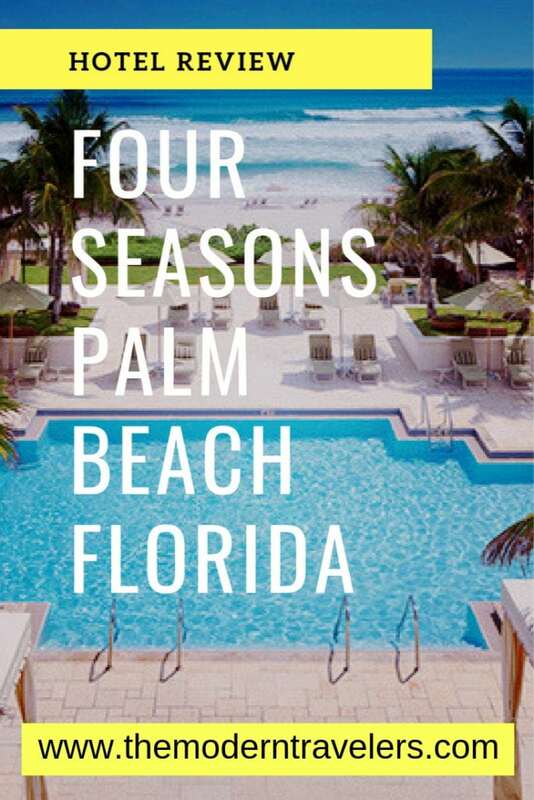 The Four Seasons Palm Beach has something wonderful for everyone and is beyond fabulous. 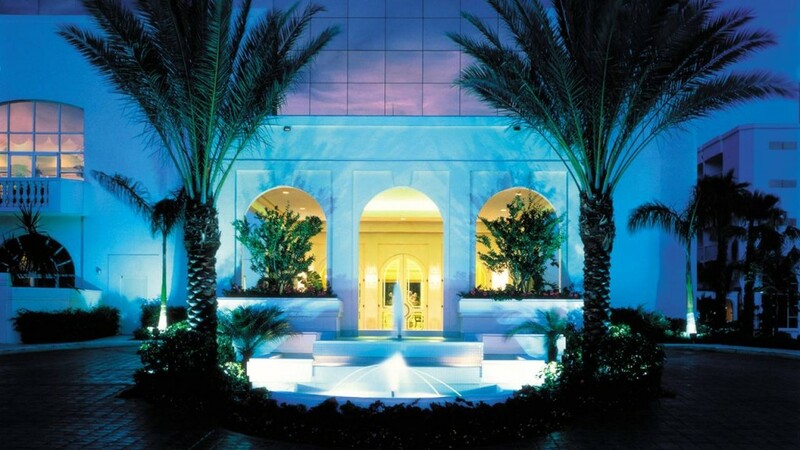 This is one of those hotels that I’d get on a plane to visit and just stay there without wanting to leave the grounds. And that’s the only drawback to staying here–you probably won’t want to leave and that could get in the way of exploring the area. Find out more on their website. We were guests of the Four Seasons, opinions are my own. Image 1, 2, 3 courtesy of Four Seasons.